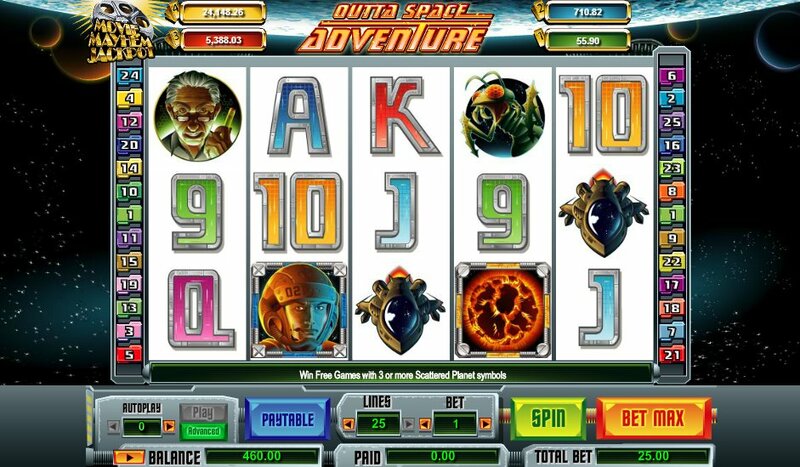 Space-themed slots are not exactly a rarity in the world of gambling, so I can’t say I was overly excited at the prospect of playing and reviewing the Outta Space Adventure slot from developer Cryptologic. This 5-reel, 25-payline online game has graphics that are not exactly mind-blowing, a theme that isn’t really the most innovative, and a set of reels that do not send the adrenalin pumping through the veins. In fact, for a game meant to wow sci-fi fans, there's little to write home about. Symbols on the reel include an astronaut, the evil villain, an alien, a spaceship, an asteroid and the love interest. There is also the standard 9-through-Ace symbols. The astronaut acts as the Wild and substitutes for all other symbols except for the Scatters to complete winning combinations. The asteroid represents the Scatter and if you hit three or more of these across the reels then you will trigger the free spins bonus round. You will be immediately awarded 25 free spins so there is a great chance to win some big prizes in this bonus feature. There is also the additional benefit that all pay outs are subjected to a 2x multiplier on this bonus feature. It is also possible to re-trigger the free spins bonus round during the free spins. Watch Out for the Movie Mayhem Jackpot! This slot is also linked in to the Cryptologic Movie Mayhem Jackpot which is randomly triggered and awarded to any player playing on a Movie Mayhem Jackpot slot at the time of being triggered. 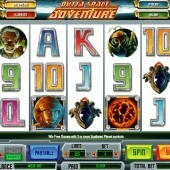 Outta Space Adventure is not a ground-breaking slot. In fact, it feels like a game that Microgaming might have rushed out on a quiet month. In our opinion, both the NetEnt-developed space-set Space Wars and the Spacebotz slot from Microgaming are more enjoyable games. Cryptologic do try to add a bit of dynamism to this slot with the symbols becoming animated when they are part of a winning combination but there’s little clarity here.